Wonderful ever-silver plant for texture and low water environments. Fine silver/steel blue foliage lines very upright wand like stems. Dense shrub to 4′ x 4′ in 4 years. 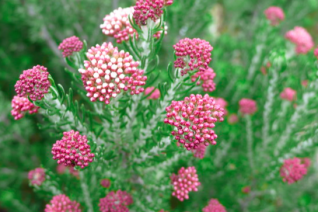 In early summer the tips of the plant is crowned with flat clusters of pink buds that open to tiny white flowers. In time the flowers go to seed and turn a tan hue. Fast growing shrub for full sun and any well drained soil of average to poor fertility. Avoid over amended soils- average native unimproved soils are ideal. Excellent on dry slopes, among other drought adapted plants. Light to little summer water. May be pruned back hard after blooming to resize, refresh the plant. High deer resistance. New Zealand. 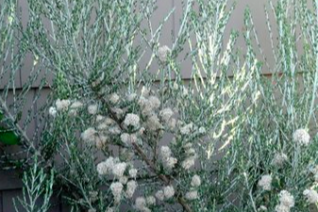 Big silvery fine textured ever-silver shrub for the hottest driest locations. To 8′ tall and 6′ wide very quickly. Upright wands of needle like silver foliage line the stems. In spring flat clusters of white flowers appear at the branch tips. A nice effect. Full sun and well drained soil of average soil fertility. High deer resistance. New Zealand. Selection made in England. May be cut back hard after blooming to resize, reinvigorate. Forms a gnarled shredding trunk in time.